SALE! Now $150, originally $295. 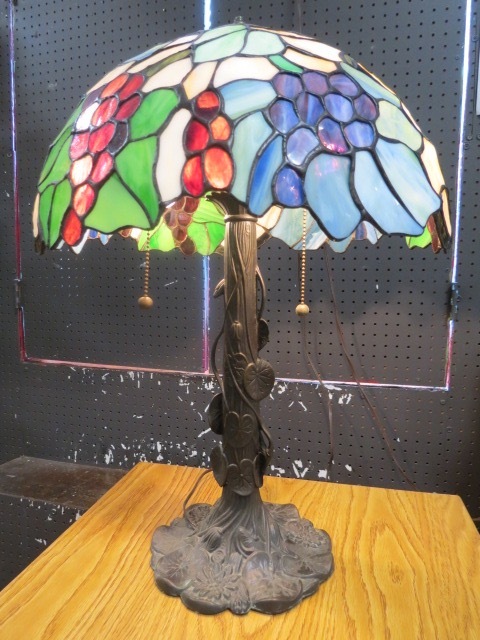 Vintage style stained glass floral & grapes lamp. Nice stained glass shade with flowers, grapes, and leaves in blue, cream, wine, and green. Metal base has lilly pads, flowers, and vines going up the base. Two lights. Add some color to your living room or bedroom! Excellent condition. Measures 24” tall, 16.5” shade diameter, and 7” at base.